While I realise my blog is supposed to concentrate on English, and studying English at Leicester Uni in particular, right now all I can thing about, or be interested about is the 30th Olympiad, otherwise known as the London 2012 Olympic Games. I have well and truly caught the Olympic bug! My addiction to the Olympics is quite startling given that I normally boycott all televised sport as the province of dull and obsessive people. But whatever, I am unashamedly hooked. 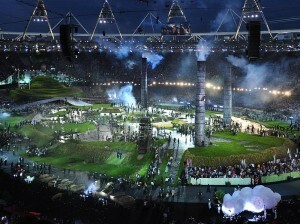 It all began with the breath-taking Opening Ceremony on Friday 27th July. I must admit, all the talk of twee countryside, live sheep and the M25 and left me prepared for disappointment an global embarrassment. But I was wrong. For me, the Opening Ceremony celebrated some of the best things about being British. The Industrial Revolution was visually stunning and didn’t need to resort to bangs and flashes to be dramatic. We showed our unique humour and love of irony; even the Queen can laugh at herself! It was fun and youthful as the show progressed and certainly had me jiggling along! My favourite bit had to the welding of the Olympic rings, it was so beautiful. Oh, and Voldemort and the rollerskating childcatcher (from Chitty Chitty Bang Bang). But the Olympics leaves no time for reflection and on Saturday morning it was straight on with the events. Since then I’ve been obsessively watching sports which I have no particular interest in, or even knowledge of! I have proudly followed Team GB hauling in the medals and have gotten thoroughly carried away by the excitement and patriotism inspired by the Olympic Games. Even better, I am lucky enough to be going to see some events first hand. Yesterday I went up to the ExCeL venue to the see the Women’s Table Tennis Team Semi-Final. Despite dire travel predictions in the lead-up to the Olympics my journey couldn’t have been smoother. Well actually, if we hadn’t gotten onto the wrong tube if would have been even better but good old Boris Johnson couldn’t have helped us out there. There were jolly volunteers absolutely everywhere, even if you tried to get lost, they’d make it very tricky for you! At the Table Tennis, Japan slaughtered Singapore which was a shame, but Table Tennis did turn out to be much more exciting than I thought! I am incredibly excited to go the shiny new Olympic Park tomorrow to see Synchronised Swimming and a session of Athletics. Although I have to leave at 5am, it is going to be such an amazing day. I am very proud to be British and feel very lucky to be able to go to what truly is a once in a lifetime experience.